If you have known me, or followed my recipes, you realize that I’m a big fan of most ethnic food, including that of Thai cuisine. With that said, don’t get startled by words such as Kha, or Gai. Gai is chicken in the Thai language, as Tom represents a boiling process or soup. So when broken down, we are dealing with a chicken soup flavored with galangal and other awesome ingredients. I have been on a continuous drive to create dishes that are loaded with balance, and in this particular one, I was driven to make a spicy, sweet, and sour soup, that had everything you wanted in Thai flavor in one spoonful. When my wife took her first bite, she stated that it felt as though someone wrapped her up in a blanket and gave her a nice big hug. I knew I must have did something right when making this soup. Now when you look at the ingredients, don’t get startled. If anything, seek them out and try something new. Begin by adding your chicken pieces, skin side up, to a slow cooker. Season with salt and pepper, and add 2 cups of the chicken stock. Cook on high for 4 hours, then remove the chicken. Reserve the stock. I poured my stock into my OXO fat seperator, and let me just say, I love this thing. It allows you to quickly strain any bits, and allows for a clean pour of enriched stock, removing any of the fat. So pour the stock into your soup pot, and set it aside. Remove the skin from the chicken and discard. Pull the chicken apart with a couple of forks. It should be super tender. Add the chicken to the stock, and bring that up to medium heat. Slice your mushrooms in half, vertically. 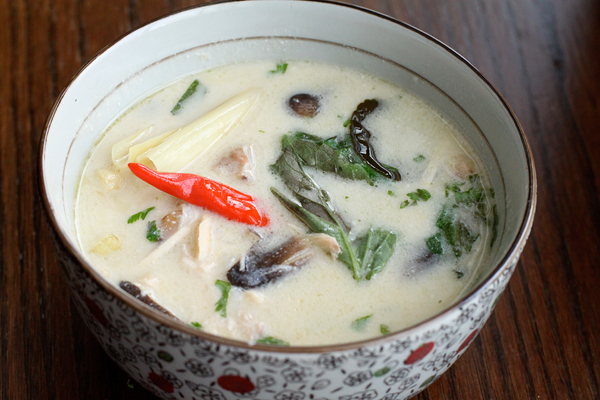 Add the mushrooms, coconut milk, Thai chilies, lemongrass, and galangal into the pot. Give a good stir, and let that come to a simmer. Once simmering, lower the heat, and let the ingredients infuse the stock, cooking for about 45 minutes. After 45 minutes, toss in the lime juice, and fish sauce. Stir, and cook another 5 minutes or so. To serve, add some of the cooked rice into your soup bowl, and ladle in a generous amount of the soup, keeping all ingredients together. Inform your guest that they should not eat the lemongrass, kaffir, nor galangal. Those are really only there for flavor. Toss in some basil, and dig in. Your end result is a bowl of comfort. It has that perfect balance of sweet, spice, and sour, and when eaten with rice, well, things just keep getting better. 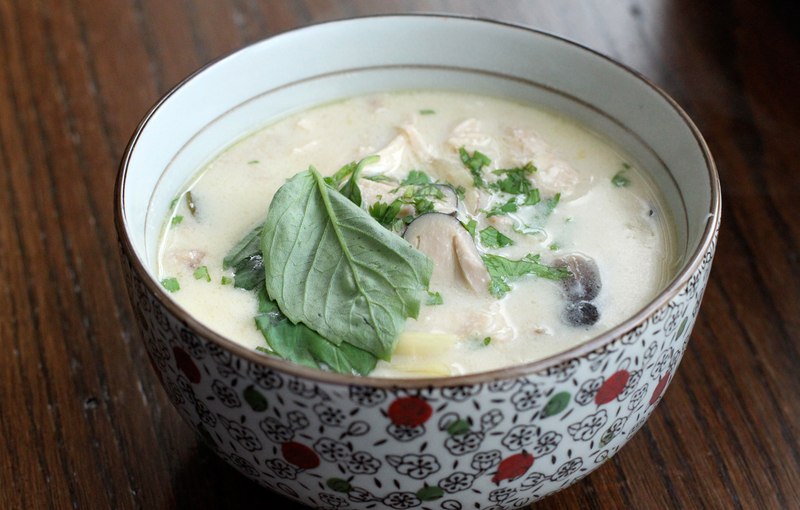 If you are looking for a great soup, that has Thai flavors and that balance in food you are looking for, give this one a shot. It is perfect any time of the year, but especially good during a cold afternoon. I hope you enjoy. I poured my stock into my OXO fat seperator, and let me just say, I love this thing. It allows you to quickly strain any bits, and allows for a clean pour of enriched stock, removing any of the fat. So pour the stock into your soup pot, along with the additional 2 cups of stock, and set it aside.